The main idea behind any ORM framework is to replace writing SQL with manipulating the objects. In the Java world, this means putting a layer on top of JDBC that will enable you to simply create a POJO, assign values to its fields, and tell it “Persist yourself in the database.” This is what Hibernate is for. 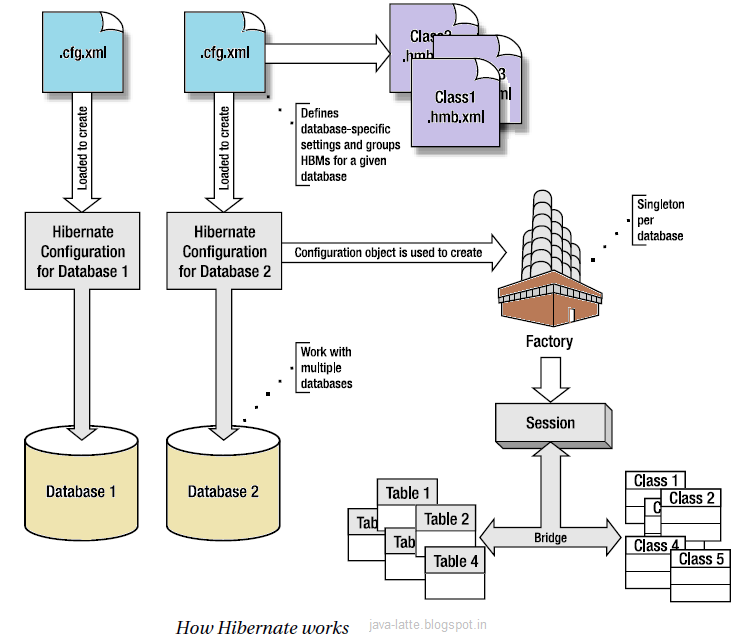 In this article, we look into overview of how hibernate works and its main components. By going through this, you'll able to answers about hibernate in an interview. As you can see from following picture, how much of Hibernate you use depends on your needs. At its simplest level Hibernate provides a lightweight architecture that deals only with ORM. Full-blown usage of Hibernate fully abstracts most aspects of persistence, such as transaction, entity/query caching, and connection pooling. Hibernate’s success lies in the simplicity of its core concepts. At the heart of every interaction between your code and the database lies the Hibernate Session. Following image provides an overview of how Hibernate works and don't need any explanation if you have an idea about hibernate. Let's see the basic introduction to all the component and there roles in hibernate. To create a connection to the database, Hibernate must know the details of our database, tables, classes, and other mechanics. This information is ideally provided as an XML file (usually named hibernate.cfg.xml) or as a simple text file with name/value pairs (usually named hibernate.properties). In XML style. We name this file hibernate.cfg.xml so the framework can load this file automatically. There is a lot going on in this mapping file. 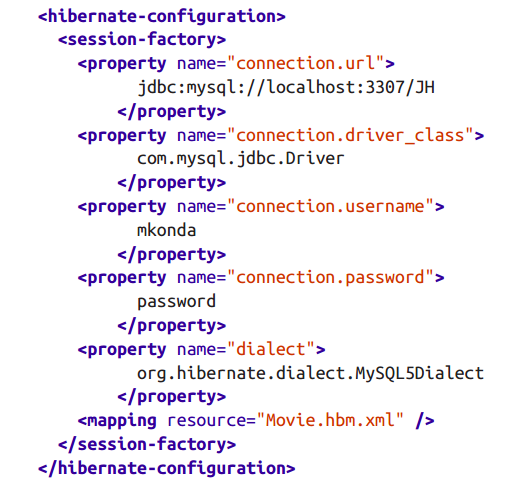 The hibernate-mapping element holds all the class-to-table mapping definitions. Individual mappings per object are declare under the class element. The name attribute of the class tag refers to our POJO domain class com.java.latte.table1, while the table attribute refers to the table TABLE1 to which the objects are persisted. The remaining properties indicate the mapping from the object’s variables to the table’s columns (e.g., the id is mapped to ID, the title to TITLE, director to DIRECTOR, etc.). Each object must have a unique identifier—similar to a primary key on the table. We set this identifier by implementing the id tag using a native strategy. What does Hibernate do with this properties file? The Hibernate framework loads this file to create a SessionFactory, which is thread-safe global factory class for creating Sessions. We should ideally create a single SessionFactory and share it across the application. Note that a SessionFactory is defined for one, and only one, database. For instance, if you have another database alongside MySQL, you should define the relevant configuration in hibernate.hbm.xml to create a separate SessionFactory for that database too. The goal of the SessionFactory is to create Session objects. Session is a gateway to our database. It is the Session’s job to take care of all database operations such as saving, loading, and retrieving records from relevant tables. The framework also maintains at transnational medium around our application. The operations involving the database access are wrapped up in a single unit of work called a transaction. So, all the operations in that transaction are either successful or rolled back. Keep in mind that the configuration is used to create a Session via a SessionFactory instance. Before we move on, note that Session objects are not thread-safe and therefore should not be shared across different classes. The Hibernate Session embodies the concept of a persistence service (or persistence manager) that can be used to query and perform insert, update, and delete operations on instances of a class mapped by Hibernate. In an ORM tool you perform all of these interactions using object oriented semantics; that is, you no longer are referring to tables and columns, but you use Java classes and object properties. As its name implies, the Session is a short-lived, lightweight object used as a bridge during a conversation between the application and the database. The Session wraps the underlying JDBC connection or J2EE data source, and it serves as a first-level cache for persistent objects bound to it. There are three possible states for a Hibernate mapped object. Understanding these states and the actions that cause state transitions will become very important when dealing with the more complex Hibernate problems. In the transient state, the object is not associated with a database table. That is, its state has not been saved to a table, and the object has no associated database identity (no primary key has been assigned). Objects in the transient state are non-transactional, meaning that they do not participate in the scope of any transaction bound to a Hibernate Session. After a successful invocation of the save or saveOrUpdate methods an object ceases to be transient and becomes persistent. The Session delete method (or a delete query) produces the inverse effect making a persistent object transient. Persistent objects are objects with database identity. (If they have been assigned a primary key but have not yet been saved to the database, they are referred to as being in the “new” state). 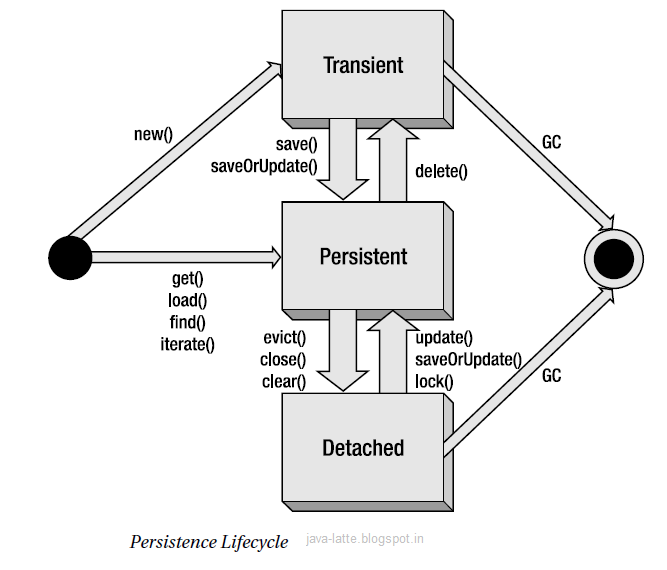 Persistent objects are transactional, which means that they participate in transactions associated with the Session (at the end of the transaction the object state will be synchronized with the database). A persistent object that is no longer in the Session cache (associated with the Session) becomes a detached object. This happens after a transaction completes, when the Session is closed, cleared, or if the object is explicitly evicted from the Session cache. Given Hibernate transparency when it comes to providing persistent services to an object, objects in the detached state can effectively become intertier transfer objects and in certain application architectures can replace the need to have DTOs (Data Transfer Objects). I believe this has cleared you concept of how hibernate works and its components. Q1 Could you explain more (or perhaps give an example) on what does it mean when you say that "Transient Objects don't participate in any transaction" ? Q2 As for persistent objects, how does one get a persistent object that has been assigned a primary key in the DB but the object has not been saved in the DB ? Transient objects exist in memory,Hibernate does not manage transient objects or persist changes to transient objects. makes a lot of sense . Thanks very much ! Very Nice Explanation..!! Thank You..!! Very useful blog. Thanks for the information.